Peachland & Okanagan Lake Aerial View. Peachland is located 25 minutes south of Kelowna, BC. 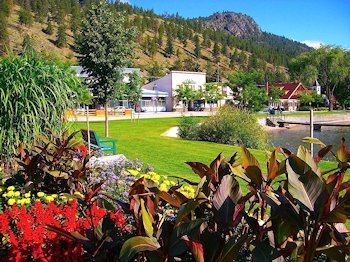 Peachlands main attraction is its downtown beachfront which runs along the scenic shoreline of the beautiful Okanagan Lake. In May of 2008 we added a wider walking path along the beachfront to accommodate all of Peachlands residents as well as visitors. Take a stroll along the lake, you may catch a glimpse of Ogopogo. Visit our unique eight-sided Museum, talk with the parrots at the Parrot Island Sanctuary or take in the short walk at Hardy Falls. Come and experience our small town charm. In 1884 the Lambly family pre-empted land to establish a ranch, originally calling their new home Lambleys Landing. On this ranch, peaches as well as other fruit trees thrived. In 1897 J.M. Robinson bought the Gladstone Mine from Gus Hewitt, another early settler. Within a year the mine petered out. J.M. Robinson had tasted the peaches at Lamblys and decided to purchase as much land as possible and create a town site as well as farming lots. He formed The Peachland Townsite Company and promoted the new town in Manitoba. Many early settlers came from there. The Post Office opened in 1898 with the postmark Peachland and the town of Peachland was established. The town borders Okanagan Lake, with its variety of unique shops, services, accommodations, restaurants and pubs. Camping facilities are located nearby. 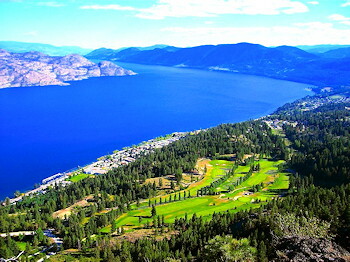 Okanagan Lake provides the avid angler with good fishing for Rainbow Trout, Kokanee Salmon, some Whitefish and Ling Cod. Accommodations: The entire area has plenty to offer the visitor in the way of accommodations. Whether you desire a lakefront or perhaps something off the beaten path, Peachland has many Bed and Breakfasts to accommodate any traveler. There is camping available along the lakefront in Peachland as well as private and Provincial parks South or North of Peachland within a 20 minute radius. Private cabins are available, as well as renting a house a week or month at a time. Attractions: The Parrot Island Sanctuary, Peachland Museum, Rattlesnake Island and of course Ogopogo. Hardy Falls is open year round, come see the Kokanee spawn from September to October. Ogopogo: Ogopogo is described as a long sinuous creature almost seventy feet long, with a head that is described as horselike. It is believed that it lives off Squally Point and can sometimes be seen breaching the surface or just sunning itself on the beach. Ogopogo makes himself known, giving us just enough information about him (or her) to keep up our interest in the pursuit. Many pictures have been taken over the years, but we have yet to see a clear image of it. Maybe you will be the one to get that million dollar shot. Recreation: Peachland offers many activities for the outdoor enthusiast. We have many walking and riding trails in the Peachland / Kelowna area. This year we added on to our already popular Swim Bay. Along with docks, diving boards and lots of water, Swim Bay offers a brand new zip line, hanging ropes and more docks. We also have Lifeguards watching the beaches and teaching swimming lessons from July 1st thru September 1st. There are a number of tours available. Wine Tours, Fishing Tours or ATV Tours, we can accommodate them all. Our community centre offers different recreational classes throughout the year. They range from Badminton, Tennis, Pickle Ball, Bocci, Dance classes, and Yoga. We also enjoy outdoor venues, such as the World of Wheels Car Show, Barefoot in The Park, Peachland Triathlon, Ogopogo Arts Festival, Octoberfest, Christmas Light up and the Polar Bear Swim, just to mention a few. There are also a number of ski hills in the surrounding area, such as Big White (80 km North of Peachland), Silver Star (100 km Northwest of Peachland) and Apex (75 km South of Peachland). 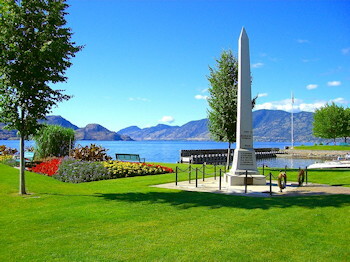 Access: Peachland, BC is 40 km north of Penticton on Highway 97 and 355 km from Vancouver. The area is serviced by National and Regional Airlines in Kelowna as well as Penticton. We also have local and National bus lines. Climate: Peachland is a very popular vacation spot because of its hot summers and temperate winters, with an average daytime high during July and August of 30.4 C. The average daytime high during December and January is 4.30 C and average low is - 5.70 C. Peachland enjoys over 2000 hours of sunshine annually and just over 11 inches of rain. The total annual precipitation is 366.4 mm (290.7 mm of rain and 95.5 cm of snow).